southern orders : IS POPE FRANCIS WARMING UP TO BISHOP SCHNEIDER WHO COMES FROM THE PERIPHERY AND IS MARGINALIZED BY THE IN FAVOR HETERODOX? 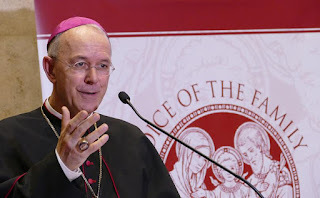 IS POPE FRANCIS WARMING UP TO BISHOP SCHNEIDER WHO COMES FROM THE PERIPHERY AND IS MARGINALIZED BY THE IN FAVOR HETERODOX? Is Francis warming up to Bishop Schneider? Well, the answer of course is a big NO! The Bishop is being played. It certainly is possible that a trap is being set for Bishop Schneider but it could also backfire disproportionately. It is painful to write this, but this Pope has marshalled his revolution where their mass of force is strong but they are exceptionally vulnerable to strikes from the support echelons. The treatment of Pell is probably intended as an example and threat for tradition minded bishops. But the most vulnerable bishops are the ones who have been most corrupt and therefore most beholden to the political and social forces in the West. So the bishops of Europe and the USA might get to take a stroll from the courthouse like Pell did. Clearly the pope is doing to Bishop Schneider what he did to Cardinal Burke. Traps and land mines. This pope is no friend of faithful Catholics. Read the letter Francis sent to Burke regarding the Knights of Malta. Pius V could have written that letter. So Burke thinks the pope is orthodox and has his back. And look what happened. This is the end for Schneider. PF is a Peronist, and like the late dictator has a habit of saying different things to different people. Bp Schneider is only 57 so should easily see off PF. He'd make a great pope, and incidentally shares a surname with Pius X. For an interesting (ironic) take this topic, see Fr. Hunwicke's post. Interesting, I made the point that PF was raised in Peron's Argentina. Peron and his wife were evil state worshippers (once they ran the state) who presented themselves just as you noted.